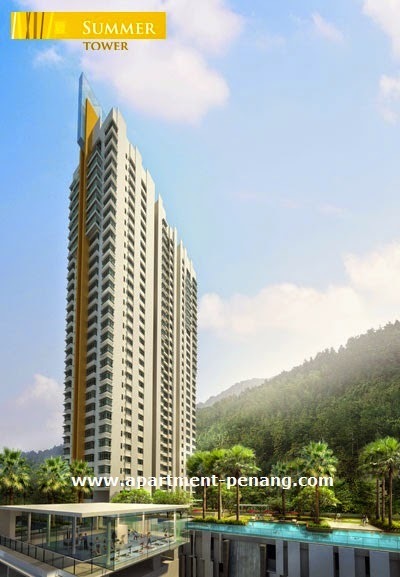 All Seasons Park condominium is located along Lebuhraya Thean Teik in Air Itam, Penang, All Seasons Park comprising four 30-storey condominium blocks namely, Spring Tower, Summer Tower, Autumn Tower and Winter Tower with a total of 808 units. All Seasons Park has 12 layout design, of which five are penthouses, both single level and duplexes with an average size of 2300sf. The remaining seven are apartment layouts, starting from 856sf to 1323sf. 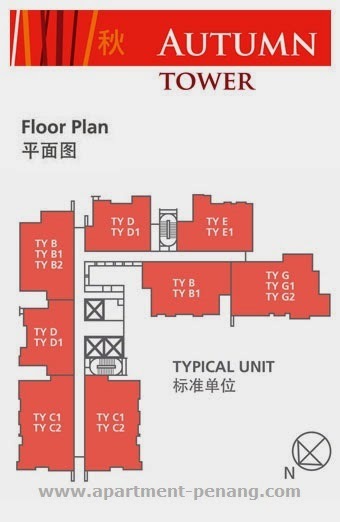 There are seven or eight units on each floor. Facilities at All Seasons Park include a viewing deck, water feature, relaxation pavilion, meditation lawn, wading pool, pool deck, swiming pool, bubble pool / pool bed, BBQ pavilion, recreation park, multi-purpose room, sauna room, games room, gymnasium, children's playground, children's play room. Built-up Area : approx. 850 - 2000 sq.ft. This happend almost everywhere in Pg I guess. Does anyone knows the prices already? grave yard views and traffic jam noise. Congestion is every where in Penang. If ops for non-congestion living place, i think this island is not the right choice :) even balik pulau and teluk kumbar is started to join the crowd....so i think the best way is adapt to the environmont or leave it...is this project launched? free hold? but i heard the MF is sky high RM0.20/sqft...can someone confirm this pls? how much is this? and the maintenance charges? If not mistaken the pricing will start from RM150k or RM180k so be prepare, once they launch someone will "goreng" it, Gd luck, like Palmyra Residences at Balik Pulau. Does anyone know where is the developer's office? kenD, thanks. Irene, would you mind to share the contact of the seller you mentioned? 99k sounds like a good deal. Thanks. Irene -> "Even they sell you RM75K also dun buy...you will cry..."
Irene, you have your point abt the heavy traffic jam. It's true, the queue is long after 6.45am. I take that road everyday & kind of frus. However, still curiuos of the BL Garden RM99k unit you mentioned, may i have the owener's contact no. please ? Thanks. Where do you stay.. in Penang Island or Seberang punya ppl..?? You ever mentioned Jalan Thean Teik was the TOP 1 SUPER JAM in PENANG.. n might caught in tracfic jam for 1 to 2 hours.. r u sure..?? Do you ever use the road in front Citibank during off-office hours, do you ever use Macalister Road during off-office hours..?? Guy, come on every where in PG also JAM.. i agreed tht Jalan Thean Teik also Jam.. but not as JAM as your feedback..
You should ask.. now PG was under DAP care.. what DAP can do for us as a civilian..
How they want to improve Penang ppl life style..
not only by mouth lar..
BL Hill ppl want to let go by RM99K..?? I give you earn additional RM1K.. by buy through you RM100K.. OK..!! JAM in penang proven tht Penang was the famous place..
JAM not becoz of the property not value.. it was the goverment dunno how to control the licenses.. NOT LIKE SINGAPORE..
ONE DAY FOR SURE PENANG WILL FULL OF VEHICLE AND JAM LIKE HELL..
ON THT TIME CAN I SAY PENANG PROPERTY WORTH NOTHING..!!?? This is Penang Property blog, please try to avoid from commenting anything related to politic. I believe everybody has their point of view and own opinion. So, please avoid from arguing or condemning people, we are here to share information and please respect people. Do you know, when the launching date ? expect the soft launch to priced more than 240k++. any news for this project..??? has this been launched..?? i knew that only the Melody Homes project has been launched at this location by the developer Belleview Group. According to some news, the all season wil b launching @ end of this year. Anyway dont buy after launching cause price sure increase d. Try buy b4 launching and save $$$. Anyway Irene are you sure BL garden got ppl wanna sold for 99k? If really i might hv some buyer ler... ^^ (So when buy property must find good developer which will maintain our property value well and hv good management. Not big and cheap is consider good d). Talking about the traffic congestion. I think for ppl heading to Bayan Lepas or Butterworth all wil facing this problem. So like Yin Howe say. If u work @ Bayan Lepas go through Paya terubong lo. For those island glades go through Bukit Gambier lo. Dont go jam wf those ppl who heading to BW. Penang everywhere is jam. Just depends on where u go. If u heading to place where 90% ppl go then sure jam wht. No matter where u come from still wil jam. If say Farlim heading to BW jam. Then for those stay @ greenlane or island glades also facing same trouble. Anyway their property still keep on increase value (even though facing graveyard). Anyway the most important is trying to view aprtment when rainy day for those which have constructed (If not u wil regret lo cz i saw 1 aprtmnt offer not bad n big but when go rainy day, water running around, car park column work not nice yet some area start cracking). For those which not yet constructed must consider the achitect design @ leisure area. An apartment well maintain or not sometimes also depends on architech or developer decoration. So as well the apartment value wil increase and ppl wil prefer. 2 b honest, all this jam is caused by solely 1 person. Dr M. bcoz he 1 2 encourage ppl buy proton thus purposely x improving public transport in d past 2 decades… any state govn cant do much 2 change d situation. However, I do agree dat DAP state govn still got room for improvement on the PG traffic…. hey guys, i'm looking for a small unit, preferably a studio apartment or a 1 bedroom condo close to the airport. From my experience, the congestion mainly caused by the "kind" pxlicemen who do not follow the traffic light sequence and simply control the flow of traffic. You will find the day without traffic jam when u do not see them standing at the traffic light after BL Hill and also CGL there. Sorry to say so, i understand that they are trying to help, but sometimes they r doing the wrong thing at the wrong time. i think there's 3 main reason for the jam in farlim. 1. it's the traffic that connected to/from lorong batu lanchang. the policeman might be the least factor affected the congestion, i think. the main reason are those driving their children to school. some just "tham hong pian" and simply stop by the road side....JUST turn into the school n park lar! 2. traffic light also gila one. 30 seconds only for u to cross from lorong batu lanchang to CGL there. 3. more and more ppl staying in farlim lor, becoming more n more cengested thesedays. Anyone can confirm the starting price or price range for All Seasons Park condo? Just called to Belleview and asked, they informed that this Seasons Park is yet to be launched. It will be launched by this month or early next month. those developer are gila liao, they are too smart to see how the Melody Homes responds, of course the medium cost respond is good because recently hard to find those "super flat" with apartment facilities below 200k, although it is in congress area, with the freehold selling point, but i don`t think 300k with the 850sqf can be a hot selling. Many people was crazy of wanted to purchased of Freehold apartment, thats why they used it as the main reason to goreng the price in FARLIM. for me , landed properties was only needed for freehold, apartment and condo...sorry...i will refused. no way, freehold what so important? maybe can refinance for few percentages markup, but how many people can refinance it bcoz should pay installment for 30yrs. freehold is really good for landed property only. what? 850sqft at 260K...? Then i think Asia Height is more worth buying than this!I already gave up BL Avenue and All Seasons Park! the price 260k is not official, but should be around 250k, location for all season is nice than asia height, there have 3 storey shop and hypermarket call all season place, and police station, market. Mel, why you not think about Sri Krital apartment it between All Season Park and Asia Height? Could you provide Sale person name ? Mind to share the total units available from this project? Is the S&P fees covered? How many car park available for each unit? recently i went to hava a look that the location, for me the pirce should be not more than 260K for 850sf. The location is ok just imaging that the jam along taht road. Anyone know more details about this project already? Mind to share? u went to there u will see they are 1 building in progress , that is one of the all season place project , but it will be use for all season condo showroom, i believe that price is not more than 260k inclusive car park. but do you guys think that is a smart choice to buy a small place condo in that location ? it is over pricing even if it is 260k onward? Does anyone have the layout??? Last week, i went to sale office and almost 40% of the blok A been sold out. There will be officially launch on 3/12/2009 at Gurney shopping Mall. I am showing interest in buying a unit there, any ideal? went to their sales office on last thursday.they were doing a soft launch for dis project for Spring Tower(Tower A).d price starts fr 249k for 856sqft. early birds get discount RM10,000 for 856 & 886sqft type n discount RM20,000 for 1000++sqft. Hi Guys, I have book a unit with early bird discount. Would like to transfer to anyone who interested, please email me at stitchbebe@gmail.com for further details. 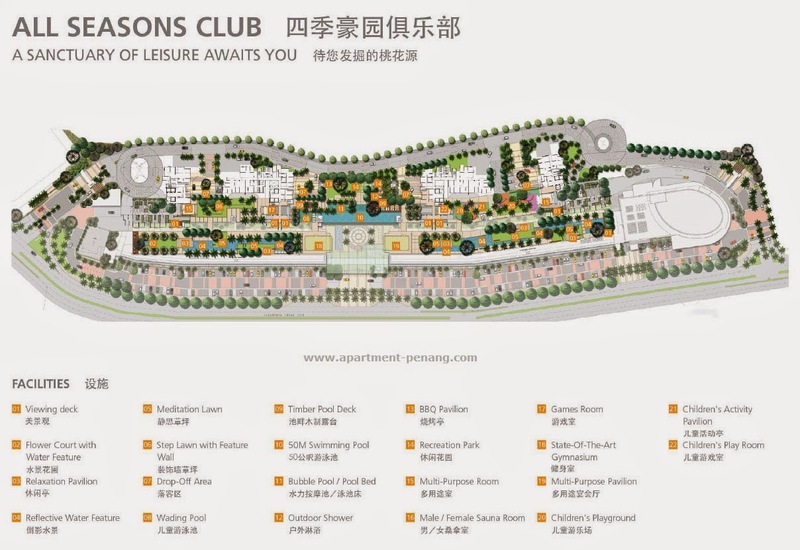 All Seasons Park….. a new landmark for Penang, giving you the latest in design and innovation, the best club facilities in town, the biggest condo development in Penang, the only freehold land in that area and the final countdown to the best package in history. 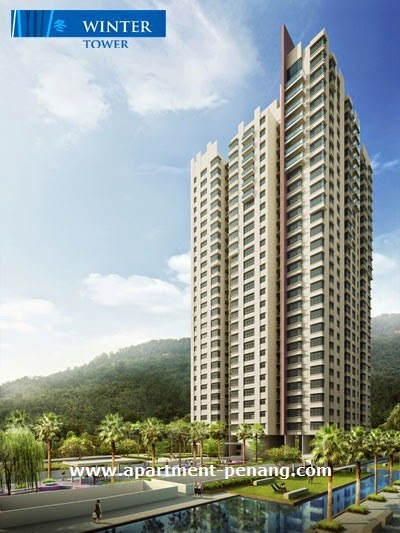 For the first time, Belleview Group will showcase …… A New Season begins with the launch of Spring Tower comprising of 184 units of superbly designed condominium with full facilities. Spring Tower is serviced by All Seasons Club, a top notch private facilities deck on the 7th floor, with a 50m infinity swimming pool, state of the art gym in a glass cube, relaxation pavilion, meditation lawn, wading pool, bubble pool, BBQ pavilion, recreation park, sauna, games room, children’s playground etc. We have also set in store for you, a continuation of Belleview Home Plan, which is incredibly affordable, burden-free and big on savings. Enjoy the 10% down payment, 0% interest until handover of keys and free legal fees on SPA. Belleview is also giving away up to RM 20,000 discounts for the first 50 buyers at this special preview in Gurney Plaza from 3 – 7 December 09 only…. which means that you will save up to RM 60,000 in cash alone. 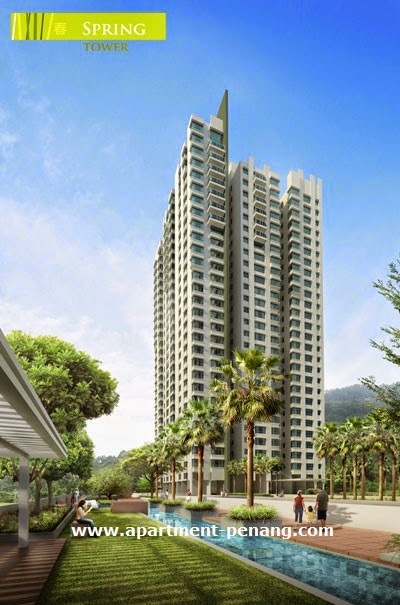 Spring Tower, All Seasons Park is truly a must buy for all ... be it for those who wish to upgrade their homes, or for investment purposes….. do drop by as the new season begins with Spring Tower. For more information on your new home, please kindly call 04-282 1999. Forseen potential growth?? Percentage?? How long it will be?? Any info that did Bellview developer liase with government term of improving the traffic/public transportation, control area/ppl population and security?? I myself book 1 unit during the soft launch. Type 2 and facing the blok B. For me the location cant deny will be jam, but when thinking of facilities between distance (farlim area), is still can be consider. I am one of the buyer of The Spring Tower. Hope this forum will united all the buyer. Hi Tan, me too one with balcony. Hi Jojo, will All Seasons Place complete earlier than condo? Your comment towards the All Seasons Park and BL condo is abit to harsh. I believe that you may acted in a manner of prejudice rather than rational thinking. Hmmm.. it sounds interesting that you're able to get RM99k for BL Garden condo. Can you get me 3units of 700sqft each at RM99k please, for each unit i guranteed you wif 2% of comission from me. Thanks in advance. Please try to think harder lar, what can DAP do under their ruling in A Year PLUS PLUS time. There is a phrase in English that said even the great "ROME was not built in one day" ok? Try to think harder lar, MR.RRR. I'm 100% agree with you bout that. It is Dr.M idea to create a relatively cheap and yet affordable vehicle for all Malaysian. Wakakakaka, actually it is an idea from him to generate more cash to support his son from liquidation. Its a good one. 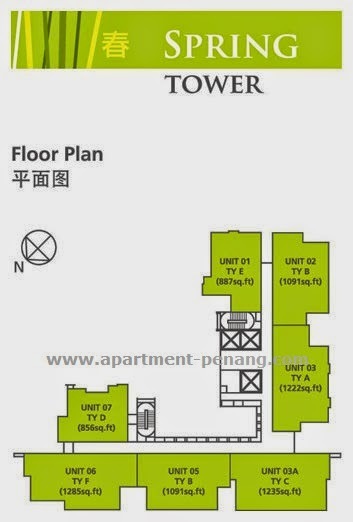 To be very frank, RM250k for 856sqft low - medium end condo it is a bit too pricey. I believe that penang properties is still relatively cheap if its to compare with Singapore, Hong Kong, S.Korea and not to mention our very own Kuala Lumpur properties. At the end of the day, its you who decide what's best for your home sweet home and your investment. i like the four season design very much so i went to see the sale result last week. Almost 60% sold out. 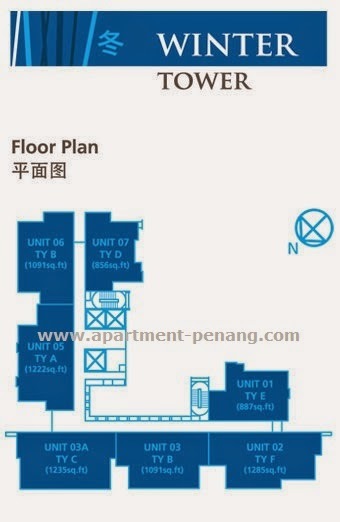 hi all, can some 1 gv me some comment on condo in penang? lately i do check a few new launch condo. i need advice from u guys, now im looking on the peak, the oasis and all seasons. which 1 is better cos 3 also bout 1000 sf. n d price is around RM300k, pls gv some real comment ya. thks. i personally live in farlim for 13 yrs, i recently booking a 886gsqf unit as a early bird and get 10k dis. (facing to Melody Home), and also buy a nice place extra car park :). Paulz, personally i don't think balcony is a big deal. i myself prefer a no balcony apartment. if u notice, most of the apartments in pg, the tenant tends to misuse the balcony as a place for them to dry clothes (those who hang their underpants and some other weird stuff). although there's no laws of restricting such incident but as more and more ppl are doing this, it totally "destroyed" the image of a good apartment. so with a none balcony, you can at least controlled or minimize this situation. has anyone notice the price of the penthouse for the all season spring tower? my GOD. RM740K. this is the first time i've heard a unit cost more than rm500k in farlim. unbelievable. can anyone share me the unit cost with area 1000sqrt? 296,900 (after disc.) for floor 9 (min floor). Add RM1K for each higher floor. If wan to buy for investment, the price from developer maybe a little bit high and the return maybe after 2-4 year. If buy for personal stay with family, is ok with that price (around 275 per sf) with all facilities around. I personally agree with Yin Hoew that no balcony is ok as your living room will much bigger. Did any body checked with the sale result from bellview group regarding the spring tower? Your comments sound like those sales girls that i got hear before when i had visited to Belleview sales office. In my opinion, this is depends...some people like balcony due to can enjoy nice view and fresh air while sitting at the balcony. Hi! Gazer, Yes, All seasons place will complete earlier then All season park. This coming 24-12-09 till 27-12-09 there will be an exhibition at gurney plaza for "all seasons park", 1st 30 ppls buyers will get discount. how many types they hav for tis All Seasons? Smallest sqft? bigger sqft? How much is the price for blok B? It is the same with blok A? When is the blok B, C and D launch? Did any one can share the knowledge of Feng Shui in this Spring Tower, and Four Seasons Park? As i know the Spring Tower is facing the Funeral Place. Helo. It is All Seasons Park is under commersial lot or residential lot? Where those buyer of spring tower? this forum should be a place for all buyer to voice up and share. I am buyer of Spring Tower, i agreed with Fei Kuo that all buyer should share in this forum. Anyone had sign up the S&P? how about the loan? hi, any one sign up snp? I had signed the snp. how about the loan? hi all, not just about under commercial lot or residential lot. It is also about how the developer intents to subdivide this piece of land. One possibility is the melody home on one lot, 4 seasons towers on one lot. Every individual shop lot on one lot itself. Bear in mind that one master title can only form one JMB/MC in future. Ya. I agreed with PT, that only 1 master titile for 1 MC. However what in my mind is, are developer going to subdivide to 3 lot? Mean 3 title each? Any one can share? I went to Sale Office on last Saturday with my wife. The sale girl told me that all seasons and melody home are 2 seperated title. However the all seasons place will be under strata title name of belleview group. In this case, can the state gov allow them to subdivide it into 2 different lots? Regarding this question, actually is up to belleview (as i think they must do it to protect the buyer) whether they wan to subdivide the titile of seasons place and seasons park into two seperated title. As i read the carpark agreenment, the car park floor are not going to subdivide, mean (as i understood) all the seasons place are not going to subdivide which will remain 1 individual titile. In that case to get strata title for the residential unit, they must subdivide it the master title to 2 seperated lot. i've bought a unit at Spring Tower and Belleview gonna launch Summer Block tis coming CNY!!! Special offer will be given out...and heard that their package gonna end soon for the 0% during contstruction. How much percentage has been sold out from the spring tower already? Summer in cny, how about Autumn and Winter towers? Will Summer or Autumn facing the T-junction opposite the project?? any comment?? I'm interested but I'm totally a noob in purchasing houses..
Can anyone share whether Summer is good for investment? I personally thought that RM270K for 856sq ft is a bit too expensive but off course the facilities and finishing seems promising. Also, with the 0% interest till completion sounds good. I am considering buying a unit but can anyone here who is familiar with property investment or those who have bought a unit share some opinion whether this is a viable investment in maybe 5 years time? FEB 18 — A promising premier lifestyle destination located on 20 acres of prime land, without enough setback and buffer from Lebuhraya Thean Teik. The property is surrounded by 1,300 residential units of All Seasons Park and Melody Homes and 115 units of three-storey shop lots, and flanked at both ends by major anchor tenants. Is this a smart-growth that promise reduced congestion, clean air, affordable housing, open space protection, and reduced urban-service costs? The project site is located along a short stretch of a narrow street without alternative routes provided to divert traffic circulation. Without enough front, side and rear yard setback and buffer zone, it is a very ambitious project that attempt to put too many people on too little land; 1,300 residential units with thousands of shoppers on a 20 acres of land with a single access road of less than a kilo meter. The project is built on an excavated hill slope, with limited space for parking , driving, entry and exit points, and no right hand turn when exit from the project site, the project would create enormous traffic problems for Lebuhraya Thean Teik and its surrounding neighbourhoods. Channeling all traffic into one intersection without a single traffic light is the best recipe for traffic congestion, definitely not a best solution for prosperity. The land is deemed topographically unsuitable for high density residential occupancy and commercial traffic. Disregard the land use compatibility with the surrounding neighbourhoods and traffic, would make this project a big time failure. Development is not about just building more high rises and shopping complex. It should be about the sustainability of the project itself. The state government should explain how the project could benefit the Air Itam township in term of providing employment opportunities, reducing commuting pressures, generating local demand for services and supporting industries, and generating demand for housing? Will the project eventually end up as another suburban sprawl due to bad traffic congestion along Lebuhraya Thean Teik? The whole project would end up as another abandoned or lowly occupied commercial and residential areas. Only a fool without common sense would invest his/her hard earn money on a project that destined to fail from the very beginning. The state government has the obligation to stop this type of development which bring no benefit to the people. The state government should stop all the excavation carried out on the slope as it is a dangerous activity and done without studying the full impact of the instability problems of the entire hill slope. Is the state government allowing developers to build landslide hazards disregard about the safety of the surrounding neighbourhoods even if the project might lead to a calamity of catastrophic proportions in the future? Lim Guan Eng may again blame Koh Tze Koon for the approval of the project, and claimed that it is too costly for the state government to stop the project. This will end up as another example where developer get his way with no benefit to the environment and the people. The existence of such type of project speak badly about the competency, accountability and transparency of the current state government. Take a look at the following table regarding typical densities. The 1300 dwelling units on 20 acres translated to 65 dwelling units per acre far exceeding the 20 residents per acre as defined in the table for high density residential occupancy. Density refers to the number of people or jobs in an area. A dwelling unit typically consists of average 3 residents, making this project having a density of 65x3=195 residents per acre. About 10 time higher than the permitted density without taking into consideration the commercial traffic generated by shopping events. Who on planet earth can approve such type of extreme congested development? Only in this Bolehland where both Pakatan and BN state governments have the stupidity to make such an incredible decision on development density. Low-Density – Suburban 0.5-5 residents per acre. Compact – Urban More than 12 residents per acre. Various combinations of detached houses on small lots, duplexes, townhouses, and low-rise (under 4 story) apartments and condominiums. High-density More than 20 residents per acre Low- and high-rise (more than 4 story) apartments and condominiums. This project do have negative sides, however as a buyer of this Spring Tower I look at positive sides. Dear Ong Eu Soon, your calculation method is WRONG and MISINTERPRETED the definition. Do check your fact. Please prove that my calculation is wrong and misinterpreted. Ong Eu Soon, please show me which highrise project/s having only 20 residents/acre? Check this news cutting by Googled "Taman Cemerlang", https://sukaweb.penang.gov.my/pkn/Akhbar.nsf/981d6336478572e5482575e6002c4e9f/7048cdf026df4a55482575fb001d3c75/$FILE/090722%20A%20new%20life%20for%20project.pdf The original abandoned Taman Cemerlang were left 1200 purchases in trouble servicing loans. Don't you agree abandoned projects are eyesore in our land? PKC, Quayside build on 20.8 acres land with 1072 units (7 blocks), if using Ong Eu Soon's calculation method, there will be ~51.5 dwelling units/acre. 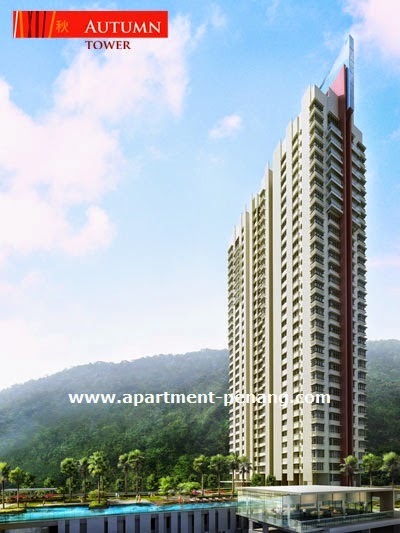 Moreover, this is high-end project with ~RM600/sf, doubled the price of ASPK ~RM300/sf. I believe the density compactness definition of the area needs to consider other supplementing factors such as accessibility, they must have enough alternate exit/entrance, decent road size & established township. Do look at Singapore township planning, crowded/high density but accessible, and traffic flows never a big trouble. Please be noted that, The Peak by Ivory is another high density project and area at Tanjung Tokong to Batu Feringghi what is going to look like in future? 20 dwelling units per acre is the measurement used by KTK to cheat Penangites. Even if I use 20 dwelling units per acre as the the reference, it will translate to 60 residents per acre. The 195 residents per acre from my calculation is still 3 time higher than the KTK's permitted density. The density of 20 residents per acre that I used is taking from Transportation Demand Management Encyclopedia, http://www.vtpi.org/tdm/tdm12.htm, which is a better reference than the one used by our local government. You're barking on the wrong tree, your topic of discussion should target Malaysia Highrise projects in general. This is digression. Btw, Penang's present government is working 4 years project for traffic masterplan with minimum help from federal, perhaps you should find out in details and share with us :) provided majority of Penangites will still give the mandate to them in next election. Just want share that got 1 project by local developer in Tanjung Tokong (as what I think) is much and more density that All Seasons Park. With 3 Blok X 38 Story X 6 Unit Per floor and other future development what is the density? The road toward the project? Please correct me if I am wrong. when will it launch ? cos they just launch Block B. Guess Block A/B Tower are facing Funeral hill. Pls keep me update of the launching date. Had any body get back their stamped S&P? For those who are Spring and Summer buyer, wan have a meet up? Not even a single call from them yet, even official receipt took so long to issue after made the payment. Sometimes I wonder why some ppl like to compare with other project some more MENTIONED the project name and so on! This is really brainless...... Talk bad about others to credit the own ones. Just imagine, what if other ppl do the same to u, will u jumping up and down? If u down like it, why u do the same to others? When u destroy the dreams of others; u produce those individuals that will create your nightmares! Dont u agree? For 100% positive comments, perhaps the only place is developer's websites. This is forum dude. Use ur brain to distinguish facts correctly. Guys, try to live in a real world. There tends to be both praise and criticism, human being only able to learn and know how to distinguish between good and bad. If always like to hear sweet phrases, you may end up live in fantasy world. hey, gazer my friend, do you really think penang properties going to raise under barisan national, huh?. Know your enemies, my friend. Well, please allow me to clarify. Regardless the comment is possitive or negative, its ok to share. But please just comment on the own project/ property. Do not talk bad about others. Some more its not relate to comment other project here. Dear Tony, I never mentioned abt BN, where u learnt it? anyone of u have bank loan agents'contacts? there have a lot buyer joined and discussing, check it out ! You heard from who maintenance 20cent/persq ? As stated in SPA and from the developer. R u parcel purchaser? maintenance fee is 0.18/psf. but you gotta add 10% for sinking fund. May i know when will be the Autumn and Winter launching? I go to the show unit galery,look very elegant and spacious. i am one of the victim of "Taman Cemerlang"... This land had been cursed. It will share the same fate as Boulevard. With no prejudice I just want to share my experience. In the recent sales launch in queensbay mall, I went to the developer booth for enquiries. Because of I have a grandmother in well chair, so I am very concern on the friendly environment for handicapped used. On that day, I was served by a lady who claimed she is a manager(the name card shows Ms Tan), I always like to speak to a higher position personnel in a company as I thought they are more informative and decisive. Guess what, very funny is the lady hardly know anything about the handicapped used in the condominium. She also cant confirmed whether there is any allocated handicapped carpark available, such a simple question she is unable to answer, WHAT A SHAME. From here, I truly urge the company to have well trained sales personnel because as a buyer we really need a proficient person in selling because the house is not build there yet and we can only based on their sales speech. I even experienced once, when I walked it to make an enquiry, the lady said to me : What do you want ? These people, only working slave, they never care about actually they are representing the company, simple as it is. Since they are invest no capital to the company but time to exchange their salary. Good luck to the lady you mentioned Ms Tan. Hello, where to see the galery of Autumn & Winter? CL, you can go to their office on the construction site. They have a showroom there. btw, do you know which phase of projects they shown? How about Autumn & Winter? Can you input somemore? They have built up 3 layouts in the showroom, 856 sqft and the other two are 1000+ sqft. If not mistaken, the layout for both autumn and winter are the same, just that winter comes with 7 units per floor while autumn has 8 units per floor. Great info, thanks so much. I going to visit this coming weekend. I really wish that All Seasons Park will be landmark to Penang Island...just like area near E-Gate. Hope Belleview will bring up the Name of All Seasons Park. No deny location...but I myself bought a unit in Spring and my wife and me really hope to see that All Seasons Park will become landmark and Medium High End Condo in Ayer Itam. Personally I don't think this is a really good investment, 856 sf for 265k++? Cmon',plus the damn traffic? If it was me, I wouldn't be buying here at all. haha...don't even need a car in pulau jerejak! The All Seaons Park Condo is residential titile it is? As I know the shop lot (all seasons place) are not sharing the same structual of condo and is 2 title it is? Recently I went to sale office for requesting some documents and at the same time there are buyer (mum and son) siging the SnP. I asked why are so late in siging the SnP? They reply me said that they book (summer) on February 2010, and now only siging the SnP. It took 5 months...for preparing the SnP??? Wow..if I not mistaken, stil some of our friends that paid 10% before March 2010 still havent receive stamp SnP. I think Belleview should look into this issue seriusly as it really unfair for us that paying 10% on January or Februari 2010. If count on monthy interest (that 10% we put in bank), who is going to pay for our rugi? 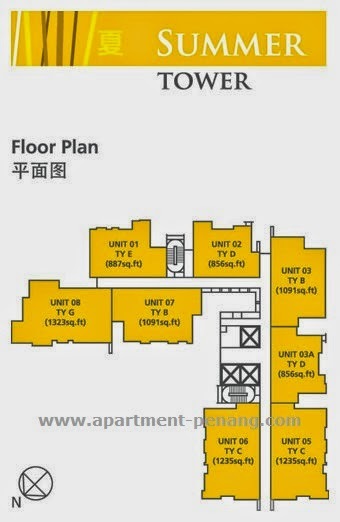 Hi All, I just went to their showroom last saturday and I plan to get one unit for myself, the price already up to RM290k++ for eight hundred over sqft, can anyone share your idea how is the rate for this apartment base on this location?i am looking for face to hill side, is it ok? Hi Samantha, you should wait for rebate this weekend during their property fair at GHotel/Gurney Plaza. Hi Gazer, thanks for your information and I will wait for the property fair in this weekend, by the way is anyone have comments for the unit which face to hill? becos i just think to take this unit. Hi Tan, actually, Belleview has been in Penang for quite a long time, since the early 90's if not mistaken. They are not as grand as IJM or E&O but you can take a look at some of their previous projects such as Mutiara Villa, Belissa COurt, Miami Green and Miami Bay, Slim Villas, Symphony park, Harmony View ..etc to name a few. Totally agreed with you.. I bought Melody Homes.. I paid 10% in March and just last month (end of June) I got my SPA stamped...Just wondering what are they delaying the SPA.. Service is really bad...especially those sales persons sitting in front of the counter but when asked queries about the house on the first day i went to the gallery..No one can answer me.. and i got so called up the management office on the spot and told them the counter sales persons were just not there to help..what's the point of sitting at the counter? The lawyer that they engaged us also gave us very bad service..Need to rush and call every week to chase them for documents..But my banker from AMbank was very nice and helpful person. I think it depends on the lawyer that they assigned to you. I was lucky, signed my SPA on june and received my stamped copy in july. anyone can tell me actually how many master title for all seasons park and all seasons place, separately into two or in-one ? You're an agent? How much discount you wanna give? Now they have "customer loyalty reward programme" 5% + 1% rebate promotion. I have paid the downpayment 10% & signed the S&P on Feb, still waiting for the stamp copy untill today. 1st they said not so fast, then said will do in batches then now they said in progress....already 6 mths! What's wrong with Belleview? CIDER, you must have gotten a very slow lawyer. Got mine stamped in less than 2 months after signing. any update from the site? pilling still going on or finished? seem that the shop lot is faster than the residential unit. Pilling and foundation work on the retaining walls are still on going. Ya, the shop lots will be completed first. Construction on the shop lots are really at a fast pace. Till today I believe All Seasons Park still the best in Market. Because of the All Seasons Club House will be the best facilities in town. Recently I went to Tanjung Tokong (area near Surin, Waterfront), I cant believe that in that small area, having of 8 Block Condo. All Seasons Park is only have 4 Block. Recently went to have a look on site, seem that the construction of Spring and Summer are bit slow. Wonder it be ready on time? May I know is there still got Spring buyer dint get the stamped snp? I was no in that Hi-Tea section. Any news from developer? Did any body (those not taking 90% loan) received the letter from the developer regarding the 1st payment? Any one have the photo of construction? Please upload. Seem it bit slow. when will be the launching of block c and d? Recently the sale girl told me that spring and summer be ready at the end of 2012. Spring and Summer buyer, what do you all think? If you ask me with the same typical question, I'll ask you back when you sign the documents before answer you on the estimated completion date. Lee, are you spring buyer? Spring buyer must and should get their S&P before August 2010, it is because most of us (spring buyer) signed the S&P before Chinese New Year 2010. I not sure about the Summer. Any how according to Stamp Act, all the stamping work must be done in 30 days from the date of signing. Thank. I bought the Summer unit. Why they took more than half year to get the copy done! By the way, what is the date of purchased stated on the S&P, I presume it should be the date of we gave the 10%, right ? Thanks for sharing. Usually it should be that way. but any how i hope all of the buyer shall get their stamped S&P in shortly. I really hope by the end of 2012 or early 2013 the all seasons park will be the new landmark of Penang Island. Desmond, mean you are not even paid the 10% yet when u singed the S&P ? I think Spring buyer should meet up someday or email keep in touch. winter open for registration, how about autumn? Who got any idea? THis is nice condo but the setback is no right turn from the condo i believe it create a lot of inconvinient with the current traffic condition at that area. Correct me if i am wrong ! I am considering to buy one of the unit by evaluating the pro and cons. I would appreciate if someone could provide me more insider information. DId any buyer manage to get the clarification of number of title for this project? THere is a sales person commented that "the developer will not allow allow panel contactor (to bao and set table on ground floor) " if it happen we could report to developer, they will resolve the issue. Any experience customer of this developer could verify this statement ? in today's star, it was mentioned that buyer get a 7% rebate... during the property fair in gurney plaza in july, it was 5%... whoever bought the units then would have paid more... shouldn't the developer be looking after the interest of their buyers as well instead of just pushing off unsold units? I'm buyer of Spring Tower, just got the stamped SPA last week. Any new member of All Seasons Park? Any how the condo process is slow...Spring Tower almost 90% sold out and Summer 85% sold out. I strongly believe that those are bought Spring and Summer are Genius buyer that for own stay. Spring is RM300 per sqft, Summber is RM350 per sqft, Winter is RM400 per sqft. This can be easily overcome by technology - aircond :) and often a tradeoff for breathtaking view. construction seems pretty fast, anybody got other updates on ASP ? What is the MR for per Sq. Ft and what is the lowest price. What is the MR for per Sq. Ft and what is Highest price. Saying that all Penang jam is a joke! Jam means jam but how jam is it is the difference. Buyers of All Season Park surely take the jam at 'Lebuhraya Thean Teik' as a major consideration whether or not to purchase this. First of all, the source of the jam is at 'Lorong Batu Lancang' which is the road all buyers will pass by either if they wish to travel up north or down south of Penang. With All Season Park and Melody adding 1000+ units, will it cause more jam? Under RM25m phase one traffic upgrade, 'Lorong Batu Lancang' will have a quote "free flow" left turn into 'Leburaya Thean Teik'. Does this means no need to wait for traffic light? Will it be sfe? (you know Penang lang always knock down the plastic road divider) 'Lorong Batu Lancang' will also have a flyover connect to 'Jalan Masjid'. The RM40billion proposal by Penang state goverment to connect 'Leburaya Thean Teik' to the coastal highway is now awaiting tender which believes will ease Penang traffic by 40% burden BUT the idea will be cancel if tender's proposal does not meet goverment expectation. So I believe it will not mature as there are technical issues as well. I also believe most All Season buyers already live in Air Itam or working at Air Itam. Lastly, All Season is located near the end of 'Lebuhraya Thean Tiek' with BL right at the end. So the jam is less compare to those living in the middle or beginning of 'Lebuhraya Thean Teik'. Ho, any idea where the road that connects Lebuhraya Thean Teik to coastal highway will run ? I saw on Ho Chin Soon maps the indicative road will run besides the All-Seasons Park ? Today's news, Giant Hypermarket going to be anchor tenant here... to be the largest supermarket in Penang. 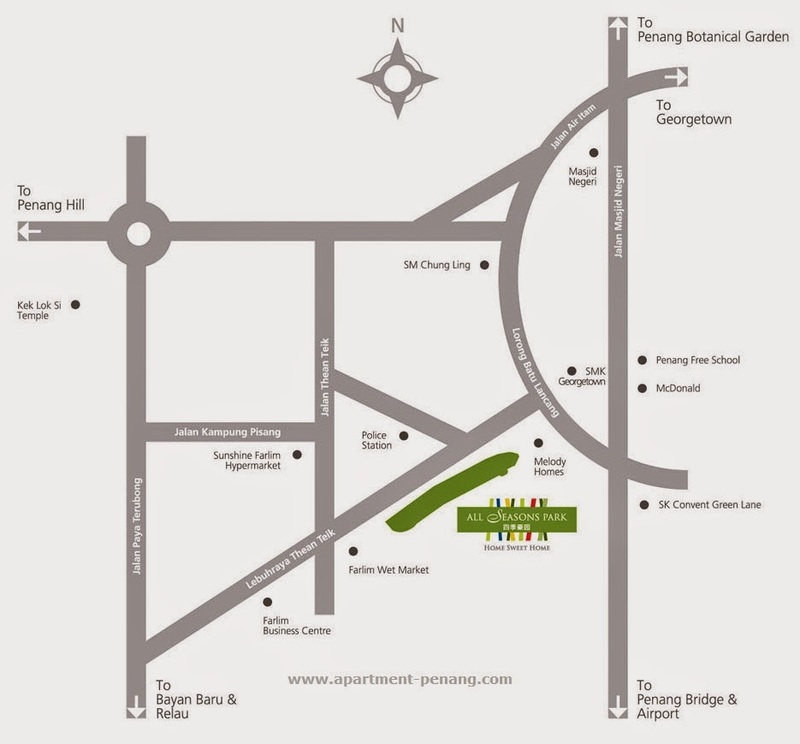 BELLEVIEW Group will open Penang’s first strip mall, the RM200mil All Seasons Place, in early 2012 in Bandar Baru Air Itam. Its group managing director Datuk Sonny Ho said strip malls were popular found in countries such as the United States, Canada and Australia. “Strip malls are owned by a single owner and managed like a typical shopping mall. “All Seasons Place, with an estimated 240,000sq ft of leasable space, qualifies as a strip mall as all the retail outlets are fa- cing the main road, has a supermarket anchor tenant, and over 500 outdoor and indoor car parking bays. “Giant, which has agreed to be our anchor supermarket tenant, will occupy a 45,000sq ft space in All Seasons Place. “We are in the process of selecting suitable food and beverage tenants to lease our retail outlets,” he said, adding that they have received over 200 enquires to lease the retail space. Ho said they were targeting about 20 food and beverage outlets to be located at the al fresco dining area. The project, which is located on a 8.09ha site, he added, has direct access to a surrounding population of over 300,000. The rental for All Seasons Place ranges between RM3 per sq ft for level three and RM9.50 per sq ft for the ground floor. Ho added that over 80% of All Seasons Park condominium, comprising 808 units, had been sold, and the last block would be launched in early 2012 during Chinese New Year. The launched units, with built-up area ranging between 850sq ft and 1,300sq ft, were sold between RM300,000 and RM500,000. Condomana: What the sub-sale value for this development project? anyone know what is the potential tenant for the shoplots? There will be sushi king, starbuck, coffee bean, paparich etc and also popular book store. Saw from some webpage, there will be giant and a gym center there too. Any idea which gym center going to open there?